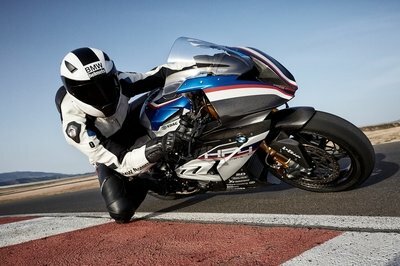 Just a glance is enough to convey the serious nature of this machine as a strictly closed-circuit or road-course bike. 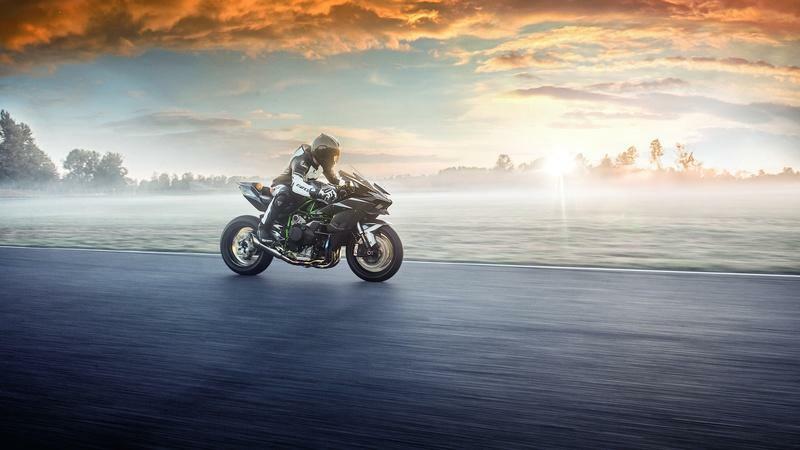 The overall design of the Ninja H2 R is the result of a collaboration between three distinct divisions beneath Kawasaki’s umbrella; the KRT branch, aerospace engineering division, and gas-turbine group. Far from being an exercise in subtlety, this is one Kawi product that leaves observers no doubt as to its nature. It starts out with a cut-down and cut-out front fender that doubles as a guard for the swept area of the inverted front forks and a fairing to guide the slipstream around the stems, thereby lowering the induced drag. The gnarly looking front fairing is dominated by a pair of intake scoops that shunt pressurized air from the entry back through a carbon-fiber duct running back to the supercharger inlet along the left side of the bike. 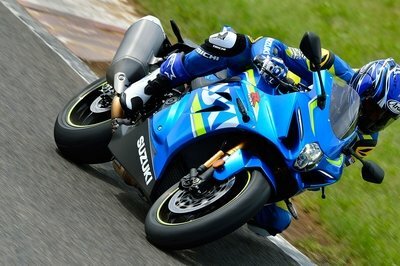 Carbon fiber is the material of choice for the front fairing as well as the quartet of spoilers that provide ample downforce when under way at speed to help keep the front wheel planted and its contact patch well engaged with the tarmac. A fighter jet-like bubblescreen rounds off the top of the fairing with Kawi’s Rivermark emblem as the only adornment on the H2 R’s visage. A pair of cheek fairings extend downward to complete the fairing and shroud the radiator while accentuating the all-up-front look of the thing. As for instrumentation, a round analog clock displays the revs with a color LCD screen that delivers the other pertinent metrics and a ring of LED indicator lights to wrap it up. The tach has a blackout background with illuminated orange numerals that light up as the needle passes them as it moves up the range for a cool visual effect. In addition to the usual metrics, the display includes a lean-angle indicator and a boost gauge that racers may ultimately find useful. A pair of dead-short control bars mount directly to the upper tripleclamp to pull you forward over the 4.5-gallon fuel tank into a most-aggressive posture that leaves no possibility of pushing off to find an upright riding position. Shoulders along the top of the tank form knee pockets on both sides where the tank wanes to meet the narrow waist at the tank/seat/frame juncture. The saddle itself rests in a deep swale created by the fuel tank hump and the upswept tail that’s capped by a fairing with no p-pad to be found. Nope, this isn’t a bike that’s built to share the fun with a friend. An underslung LED taillight provides the only illumination on the H2 R with a swingarm-mount hugger to complete the rear fling control. 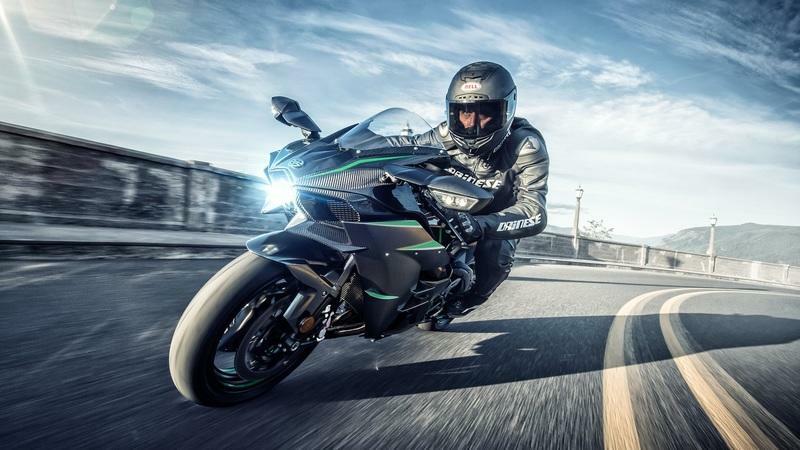 Just a glance is enough to convey the serious nature of this machine, and I would reiterate that the H2 R is strictly a closed-circuit or road-course bike. Mirror Coated Matte Spark Black is the finish of choice, and it comes with Kawi’s “self-repairing” paint that can effectively heal itself after receiving certain types of scratches. The frame is rigid enough to handle the powerful engine while remaining supple enough to deliver race-style handling and steering geometry definitely falls out on the nimble end of the spectrum. The frame has to be rigid enough to handle the powerful engine while remaining supple enough to deliver race-style handling. It starts out with variable-thickness steel tubing, and each member was precisely sized for strength and flexion before being welded-up to form the Trellis-style structure. The steering head sets a rake angle of 25.1 degrees with 4.3 inches of trail to fall out at the nimble end of the spectrum. 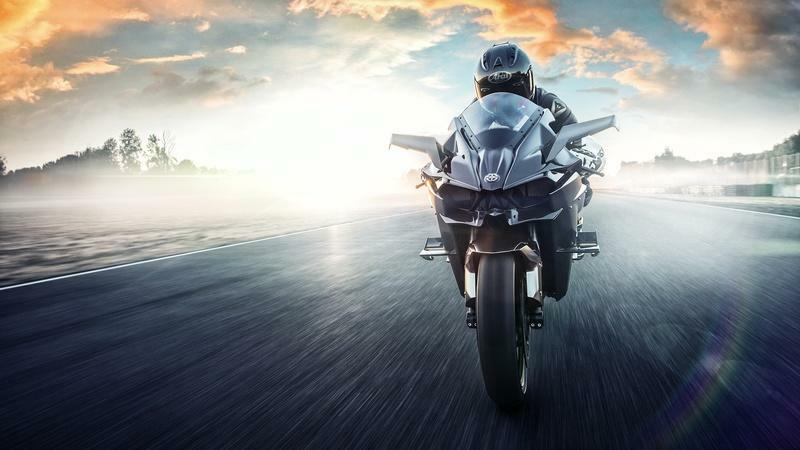 Plus, it rocks a dynamic Öhlins steering damper that combats kickback and electronically adjusts itself according to speed so it’ll automatically keep itself in that sweet spot for you. Forged and pressed aluminum plate forms the single-side swingarm with a Uni-Trak linkage and Öhlins TTX36 gas shock to tame it. The monoshock rocks the full trinity of adjustments and comes with a top-out spring to complete the package. Up front, inverted 43 mm Kayaba AOS-II forks take care of business with the same trio of adjustments as the rear shock. Air and oil are kept segregated within the stems to deliver a soft initial stroke that firms up considerably toward the bottom with a DLC coating to keep internal friction low. Suspension travel measures in at 4.7 inches up front and 5.3 inches out back. New for this year are the Brembo Stylema anchors up front that rock four 30 mm pistons in an opposed configuration. 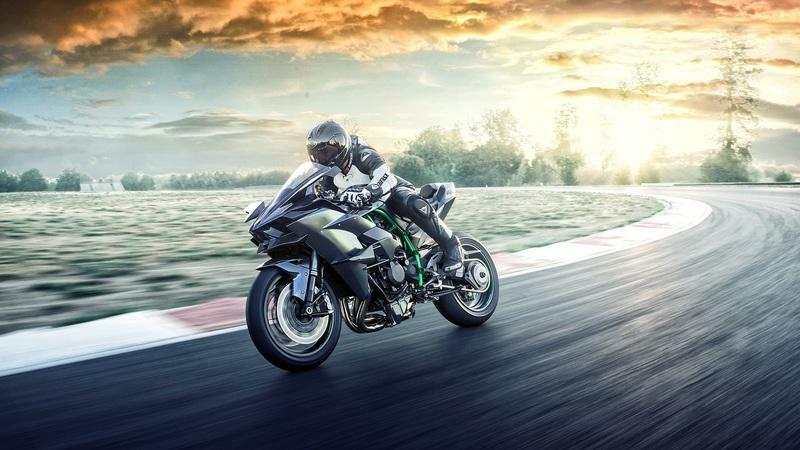 They bite massive 330 mm discs to deliver the goods, and out back, a twin-pot Brembo caliper clamps a 250 mm disc with Kawasaki’s Intelligent anti-lock Brake System that delivers rider-friendly feedback and minimal pulse-back feel. Cast-aluminum wheels mount Bridgestone VO1 racing slicks that are made strictly for track riding and must be properly warmed up pre-race to maximize traction. DO NOT ride these hoops cold, but if you’re paying this much for a track-only bike, you know that already. The factory claims an output of over 200 liters per second at a velocity of 328 feet per second with a max of 2.4-times atmospheric pressure. Yeah, let that sink in for a second. Now for the crown jewel; the supercharged four-banger that serves as the beating heart. The lump is heavily built to withstand the incredible forces generated within. What kind of forces are we talking about? Well, the factory claims an output of over 200 liters per second at a velocity of 328 feet per second with a max of 2.4-times atmospheric pressure. Yeah, let that sink in for a second. It makes for a potent air-fuel charge, and manages to somehow keep the compressed air cool enough to preclude the need for a heavy/clunky intercooler to draw excess heat off the charge. The pistons are cast rather than forged and come with small voids engineered in to reduce the reciprocating weight, and they come partnered with balanced connecting rods and a lightweight crankshaft/flywheel to help it spool up with the quickness. A pair of oil jets bathe the bottom of each piston crown to draw heat away from that critical area, and the deep oil sump is built to help transfer heat to the atmosphere and to keep the pump pickup submerged to eliminate cavitation, even under hard acceleration/deceleration and cornering. Steep over-head cams time the four-valve heads, and while the intake poppets are made of stainless steel, the exhaust valves are made from the heat-resistant alloy Inconel to deal with the extreme heat generated by the mill. There’s quite a bit of overlap, as racebike cams are wont to have, so you can count on efficient exhaust-gas scavenging as well as an abundance of free hydrocarbons in the exhaust stream, but that’s always the trade off and should come as no surprise. A quartet of 50 mm throttle bodies manage the induction, but the signal from the twist-grip is modified by a number of systems before it actually manifests itself in butterfly-valve movement. It all starts with a Bosch inertial measurement unit that reads the forces acting on the chassis. Next, a triple-mode traction control feature monitors for wheel slip and intervenes accordingly. There’s an Engine Brake Control that helps limit the backtorque in the system backed up by a slipper-type clutch for double the anti-hop protection, and a Launch Control Mode that helps you nail your holeshots. 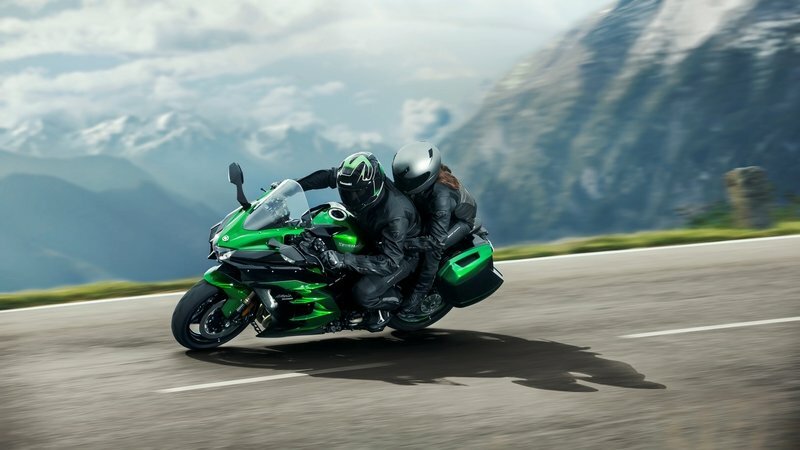 The Kawasaki Cornering Management feature bundles it all together in various combinations depending on conditions. On the straights, the wheelie control and traction control are the main contributors. As you scrub speed ahead of a turn, the engine brake control and the pitch control kick in to increase stability and safety. 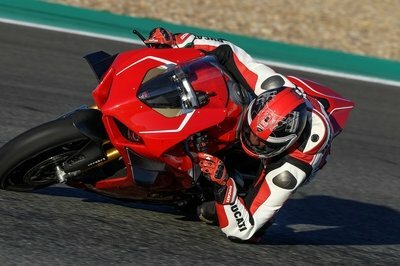 Once you pass the apex, the traction/wheelie control kicks back in along with a sliding control to keep you from pulling a lowsider due to an overenthusiastic and optimistic right wrist. The sliding control switches itself off as soon as you straighten up to leave only the traction/wheelie control engaged until the next turn. 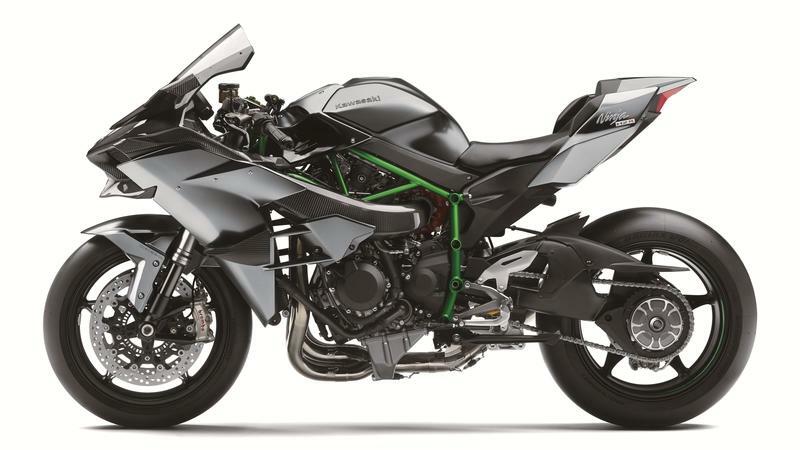 That’s a lot of technical information, but I know you’re probably waiting on the bottom line, so here it is: the H2 R generates 121.5 pound-feet of torque at 12,500 rpm (shaft), which is impressive enough in its own right, but it’s the 300 frikkin’ horsepower that takes the cake. That’s right sports fans, three hundred ponies, and it turned in a top speed of 209.442 mph at the Bonneville Salt Flats. At $55k, I certainly hope the sticker shock acts as a firewall, 'cause most of us have absolutely no business even sitting on this thing in the parking lot. It comes at no surprise that this kind of power comes at a premium. The ’2019 Ninja H2 R rolls for the everyday low price of $55,000, and I’d say this is one instance where I certainly hope the sticker shock acts as a firewall, ’cause most of us have absolutely no business even sitting on this thing in the parking lot. 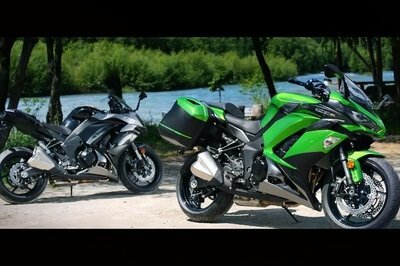 Considering what you get for the price, the H2 R looks like a sweet deal against the Honda. So far, Kawi has the only production supercharged bike on the market, but that doesn’t mean it’s without peer. Honda’s racebike division produced the RC213V more-or-less for public consumption, and it manages to land in the same ballpark as the H2 R.
A set of windtunnel-tested body panels close off all the innards to give it more of a superbike look, and less of a hyper-naked finish like the H2 R brings to the table. Öhlins products support and dampen the Repsol ride and Brembo hauls it down with ABS protection. 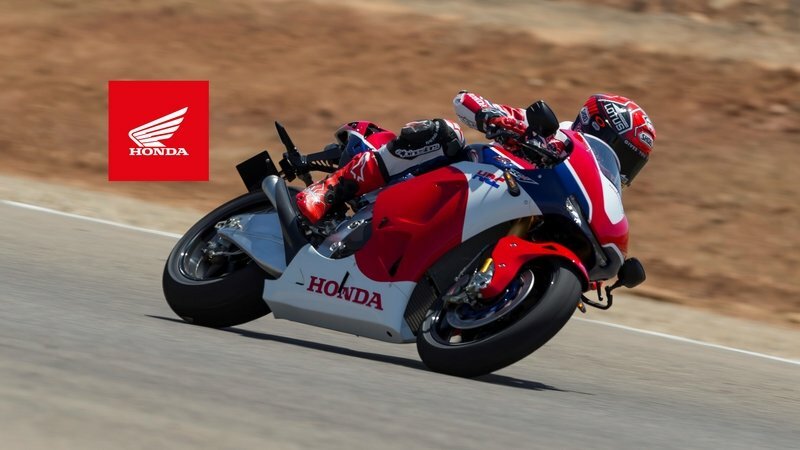 Unlike the H2 R, the Red Rider comes with street-legal components, but if closed-circuit work is your thing, there’s a race kit that strips the superfluous equipment and plugs the holes while also boosting performance. What kind of performance you ask? 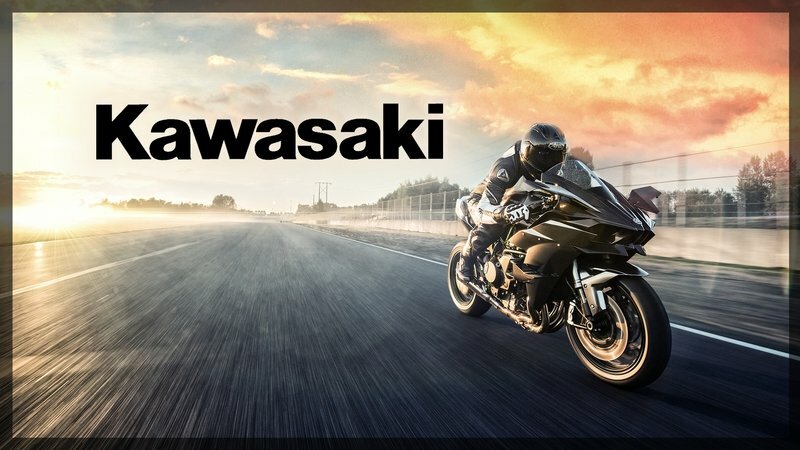 Well, Honda measures in with 215 horsepower (with kit) and 87 pound-feet of torque, which falls a little short of the 300/121.5 from the Kawi yet still claims a top speed in the neighborhood of 225 mph which is actually superior in spite of that power deficit. Honda comes off looking way prouder with a $184,000 sticker on its RC213V, a price that puts it out of reach of most, and one that is hard to justify paying against the delightfulness the H2 R brings to the table. 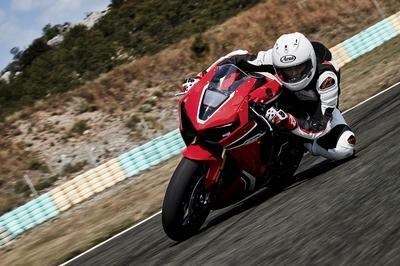 See our review of the Honda RC213V-S.
See our review of the Kawasaki Ninja H2. 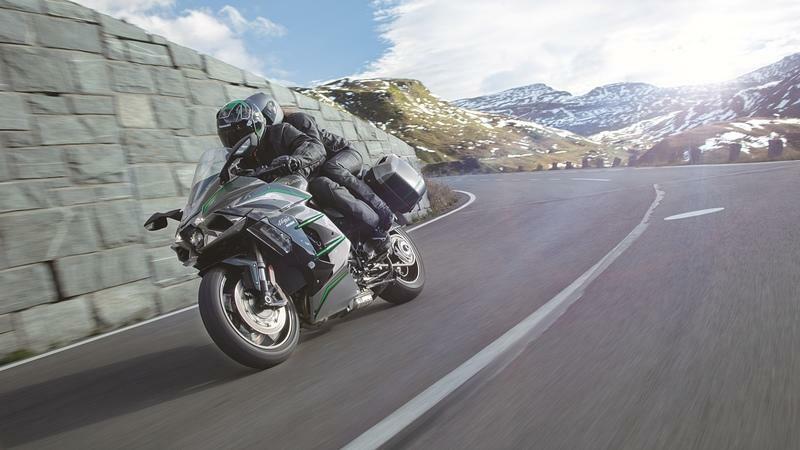 See our review of the Kawasaki Ninja H2 SX SE+. 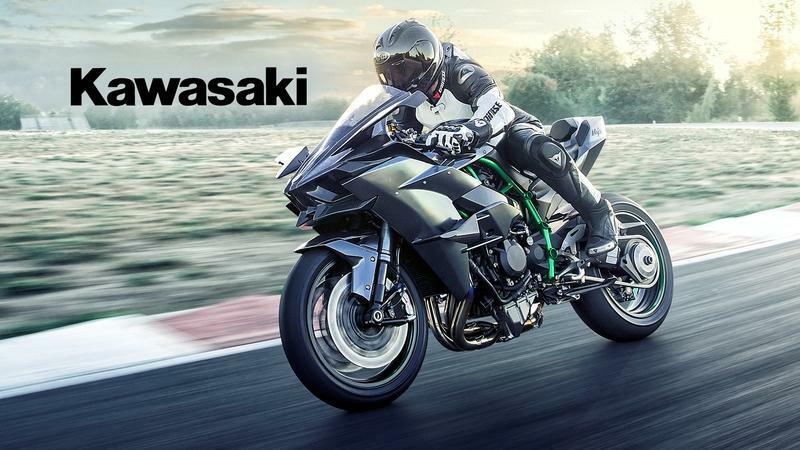 See our review of the Kawasaki Ninja H2 SX / H2 SX SE.